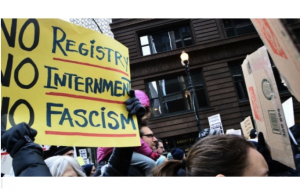 The “rhetoric of fascism” is on the rise in the U.S. and Europe, a United Nations official warned on Thursday, a disturbing trend that puts “unprecedented pressure” on human rights standards around the world. Zeid’s warning came just before far-right Dutch politician Geert Wilders—who is widely expected to win the upcoming March election for Prime Minister—was convicted of inciting discrimination for saying the Netherlands would be better off with fewer Moroccans. Friday’s verdict indicated that Wilders had planned the comments as a stunt, with the judges finding evidence that his team had coached the crowd how to respond, and saying that it was intended to be insulting to Moroccans. Although Wilders was convicted of inciting discrimination, he was acquitted of hate speech charges, and the panel rejected prosecutors’ requests to fine or jail him. As the BBC reports, the verdict will have little impact on Wilders’ political aspirations. Zeid has previously named Wilders, among other high-profile politicians such as Trump and the U.K.’s Nigel Farage, as demagogues whose rhetoric is poised to bring about “colossal violence” against minorities. He has also said Trump was “dangerous” for the international community. Under Zeid’s leadership, the U.N. human rights office is readying to condemn Trump if he puts any of his xenophobic or discriminatory policies into effect.